I want to share with you a series of moose pictures. They are not all of the same moose but the chronological order is here to show you what the life cycle of a bull moose might look like. In this picture we see a Calf Moose. When a calf is born it weighs about thirty pounds and within a few days could easily outrun a human. At this age they are very susceptible to predators such as Wolves and Grizzly Bears therefore the mother or Cow Moose does not stray very far. Fancy yourself a Photographer? Would you like the opportunity to photograph moose. 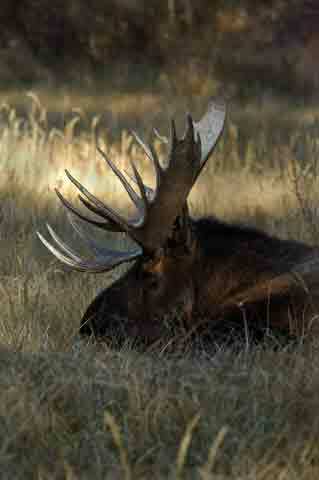 Visit the moose photography page for opportunties to go out and take your own photos of moose. Do you have Moose Pictures that you would like to share? Looking for another gallery to show off your Moose Photos? 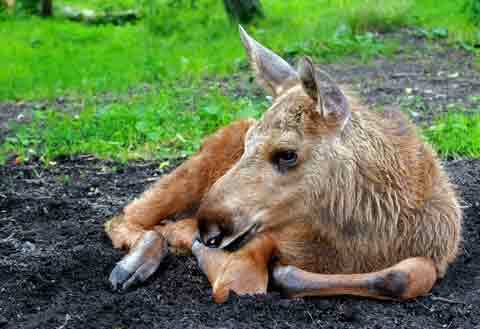 Please contribute to our Moose-Pictures pages, all our visitors love these pictures. We dressed up our travel trailer with a moose/outdoors theme. You'll find a short description and more moose pics too. 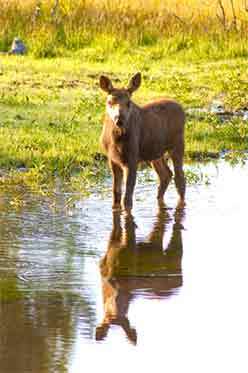 This young Moose stands at the edge of a lake feeding on the aquatic plants that grow under the water. He stands watching and listening for his mother to signal him it is time to move along. 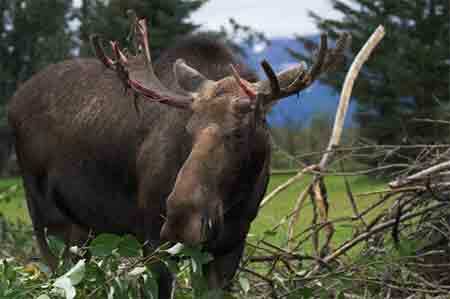 To see pictures of cow moose click here. This young Bull takes a drink. 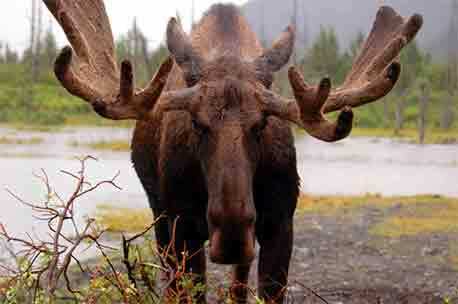 In this Moose Picture you can clearly see the spots on the animals forehead where antlers will begin to form. Antlers only grow on the males of the Moose species. Antlers start to grow in the spring and are covered in what most people refer to as velvet. Through the summer the antlers continue to grow... It is good to note here that the Antler size and number of points is mostly determined by the age of the animal. It is fair to say that a young Moose will have small Antlers, a Moose in his prime will have a very large set of Antlers, while an elderly Moose will have a somewhat smaller set. Check out our latest contest too! The moose photo contest is where you will have a chance to win some awesome moose hunting supplies. 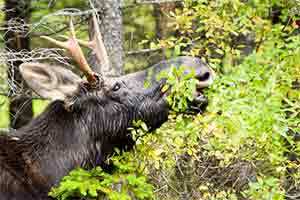 This Moose image shows a young bull eating the leaves of a tree. 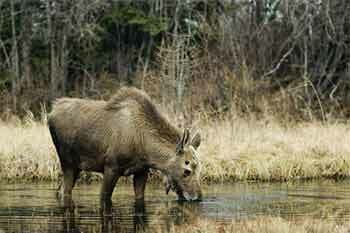 A Bull Moose will grow to weigh somewhere between 1200 to 1600 pounds with the latter being the Alaskan Moose. Fall has arrived and the Bull finds it necessary to rub His antlers on trees to remove the velvet. In this picture you can see the strands of velvet hanging from the Antler. If the strands are long enough to reach the Bull will swing his head in such a way to catch the strands and eat them. Here we see a picture of Mature Bull Moose in full velvet. He looks as though he is staring right at you!! And he doesn't look very happy. In this picture, the Bull Moose looks very old. His wide set Antlers without much mass; it would seem as though he needs all the nutrition he can get to maintain his body weight. He may fall prey to predators such as Wolves this coming winter. Moose in-the-news! 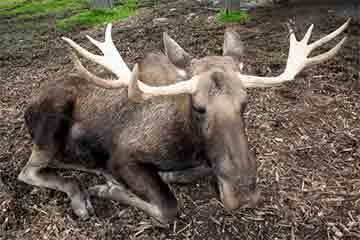 Earlier this year a young bull moose entered a closed down mill yard. Unfortunately for him, he wandered out onto a crusted over mill pond and found himself hopelessly mired in the muck. The local conservation was called upon to perform a moose rescue. We recently had a visitor share her pictures of moose playing in her yard. She lives in the northern portion of BC and regularly has moose as visitors to the property. A professional photographer (Richard Gait)who is visiting Canada from Italy to study wild horses, shared a series of unusual moose pictures with us. The pictures of moose would indicate that moose possibly have same gender relationships, or at least are working out their frustrations. Interested in seeing more pictures of Bull Moose. To go to our bull moose picture gallery. Do You Have Moose Pictures That You Love? Upload your best moose photo with a brief story of where, when or how! Did you snap your picture while cruising the highway? Were you out hiking somewhere? What is so funny about this picture or what happened while trying to take it? If you are unable to re-size your pictures... You may choose to use the contact us form to establish communications to email your photo's. I do not post my email address to avoid being spammed. This guy seemed to have no fear. Simply beautiful. This was actually the first moose I've ever seen in the wild. Talk about exciting!